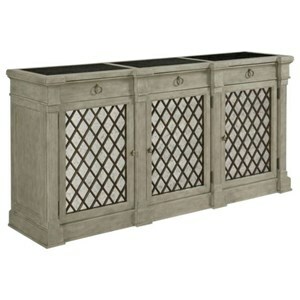 This exceptionally accommodating credenza exceeds all expectations of style and design. Featuring four doors concealing two interior drawers and two adjustable wood shelves, the credenza also includes a back three outlet plug and USB charger. Highlighted by its dyed weathered Oak veneer exterior and bronze nickel metal trim, this contemporary credenza will complete your living room space. 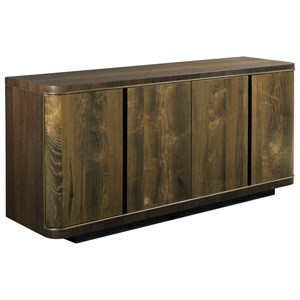 The Ad Modern Classics Darby Credenza with USB Charger by American Drew at Stuckey Furniture in the Mt. Pleasant and Stuckey, South Carolina area. Product availability may vary. Contact us for the most current availability on this product. Storage Four doors concealing two interior drawers and two adjustable shelves. Back three plug outlet with USB charger. The Ad Modern Classics collection is a great option if you are looking for Contemporary furniture in the Mt. Pleasant and Stuckey, South Carolina area. Browse other items in the Ad Modern Classics collection from Stuckey Furniture in the Mt. Pleasant and Stuckey, South Carolina area.